In 2013 our congregation was involved in a year long study focusing on Christian growth and development. Here are many of the videos and resources from that study. Before anyone can walk the path of growth they must have an idea of what they aspire to become. However, too often the vision is hindered by mistakes of the past and misconceptions concerning our own potential. Let us understand that God has a great vision for His children. He wants us to soar like eagles (Isa 40:31); to be Christ-like (Rom 8:29). In order to have a vision for the future and understanding of the path one must take to get there, one must see clearly who they are. Therefore, the focus this month is about self-awareness, self-evaluation, potential, and goal setting. Last month's challenge was to examine self, recognize potential, set spiritual goals, and begin the journey of spiritual growth. This month's focus is "devotion". Specifically, daily devotion. Having a devotional life is key to spiritual renewal. The place of attitude on the pathway of success is not a secret. Zig Ziglar is noted for saying, "Your attitude, not your aptitude, will determine your altitude". Similar words were uttered by Winston Churchill, "Attitude is a little thing that makes a big difference." Even one of our country's founding fathers, Thomas Jefferson, remarked, "Nothing can stop the man with the right mental attitude from achieving his goal; nothing on earth can help the man with the wrong mental attitude." It is clear attitude is vital to success, even spiritual success! In the Bible, "attitude" can be found everywhere. Attitude is seen in Paul's message to the Colossians, "whatever you do, do it heartily, as to the Lord and not to men" (3:23). Attitude is found within Jesus' beatitudes (Mt 5:3ff). As someone has said "the beatitudes are simply attitudes we ought to be". Even the call to obtain the "mind" of Christ (Phil 2:5), is essentially, a challenge to embrace the attitudes He embodied. In moving forward in their walk with God, one must consider, "How's my attitude?" "Worship changes the worshiper into the image of the One worshiped" (J. Hayford). An article in House to House/Heart to Heart asks, “What are we in worship for? Granted, some are there to “get it over with for a week” or “to get their ticket validated once more.” But those who are there because they need the strength in carrying their crosses know the value in truly worshipping God.” (David Lusk). Take up the call to grow in your worship and praise! These words come from Christ’s discourse on the mountain and although they are just part of that whole discourse, they embody the sense of the entire message. Jesus knew that too often the focus of the Pharisees and Scribes was outward purity. With this, Jesus revealed that the focus of the new covenant is the heart. The dictionary defines Purity as “Freedom from adulteration or contamination. Freedom from immorality.” Though, Josh McDowell has said, “You probably can't define purity. Purity is to live according to original design.” To pursue purity is to pursue God’s desire for your life. When one lives as God intended, they are unencumbered by sin and guilt. They discover the joy of knowing God. In purity they find strength. “My strength is as the strength of ten, Because my heart is pure. (Alfred Lord Tennyson). “If anyone serves Me, let him follow Me; and where I am, there My servant will be also. If anyone serves Me, him My Father will honor” (John 12:26). Before defining the Fruit of the Spirit, Paul reminds all Christians, “you, brethren, have been called to liberty; only do not use liberty as an opportunity for the flesh, but through love serve one another” (Gal 5:13). Only by developing the heart of a servant can one truly become Christ-like. The apostles often argued amongst themselves as to who would be the greatest in the kingdom. Knowing the desire of their hearts, Jesus warned them, “whoever desires to become great among you, let him be your servant...just as the Son of Man did not come to be served, but to serve, and to give His life a ransom for many” (Mat 20:26-28). Then on the night He was betrayed, He illustrated this by way of an object lesson: He “rose from supper and laid aside His garments, took a towel and girded Himself After that, He poured water into a basin and began to wash the disciples’ feet” (Jn 13:4-5). Albert Schweitzer once commented, “I don't know what your destiny will be, but one thing I know: the only ones among you who will be really happy are those who will have sought and found how to serve”. As the Hebrew writer spoke of the great heroes and heroines of old, he declared, “These all died in faith, not having received the promises, but having seen them afar off were assured of them embraced them and confessed that they were strangers and pilgrims on the earth. 14 For those who say such things declare plainly that they seek a homeland. 15 And truly if they had called to mind that country from which they had come out, they would have had opportunity to return. 16 But now they desire a better, that is, a heavenly country. Therefore God is not ashamed to be called their God, for He has prepared a city for them.” (11:13-16). They never lost sight of their goal (v. 13). They never stopped seeking their true homeland (v. 14). They never stopped looking for that heavenly country (v. 16). They never doubted that God had prepared something better for them (v. 16). All year long this congregation has been discussing various aspects of Christian growth and development. We have been enriched, challenged, and even humbled thus far in our journey. But as with any journey, to succeed one must keep their eyes on the goal, therefore, this month our sole focus will be upon the ultimate goal of Heaven. “If then you were raised with Christ, seek those things which are above, where Christ is, sitting at the right hand of God. 2 Set your mind on things above, not on things on the earth. 3 For you died, and your life is hidden with Christ in God.4 When Christ who is our life appears, then you also will appear with Him in glory.” (Colossians 3:1-4). “Encouragement is awesome. It can actually change the course of another person's day, week, or life” (Chuck Swindoll). John D. Rockefeller said, “There is nothing in this world that can compare with the Christian fellowship”. The Bible continually affirms that all must recognize our need for others and learn to rely upon one-another. In the garden Adam was alone, and God declared that it was not good (Gen 2:18). “Aloneness can lead to loneliness. God's preventative for loneliness is intimacy - meaningful, open, sharing relationships with one another. In Christ we have the capacity for the fulfilling sense of belonging which comes from intimate fellowship with God and with other believers.” (Neil T. Anderson). Robert Sumner tells of a Kansas City man who had been severely injured in an explosion. His his face was badly disfigured, he lost his eyesight as well as both of his hands. 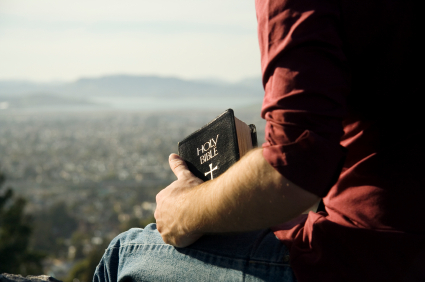 As he recovered, the man, a Christian, longed to read and study his Bible again. A friend told him of a blind girl in England with similar injuries, who was unable to read a braille Bible with her fingers but found she was able to read it with her lips. Inspired by the story the man sent for a Braille Bible. When it arrived he soon discovered that the nerve endings in his lips had been too badly damaged to feel the bumps and ridges of the text. He began to weep bitterly, his tears ran over the pages. As he brought one of the pages to his lips, his tongue happened to touch a few of the raised characters and he could feel them. Hope was renewed within him. Most people do not have to deal with the obstacles that this man faced. They can see. They can read. The problem is, too often, they just do not make the effort. "The church has many ministries but only one mission." It's a line I ran across in my reading, and can't seem to get out of my mind. I think of Christ. He performed many good works. He showed compassion, fed the hungry, healed the sick, gave sight to the blind, cast our demons, cured lepers, and raised the dead. His ministries were many. But his mission was one! "The Son of man is come to seek and to save that which was lost." And that mission he passed on to his disciples. In prayer, Jesus tells the Father, "As thou didst send me into the world, so I have sent them into the world." We all remember the charge Christ gave: "Go therefore and make disciples of all nations, baptizing them in the name of the Father and of the Son and of the Holy Spirit, teaching them to observe all that I have commanded you; and lo, I am with you always, to the close of the age." If you knew that you had only one week to live, what would you do with it? Would you tell as many people as possible about Jesus and the good things of the Gospel? I might but gasp His name. Thanksgiving is not just an American holiday, nor is it something that is seasonal in nature. It is an attitude in the Christian life which speaks of tremendous spiritual insight. It must be present all year long. Thanksgiving is an admission that though life is often hard and unfair, there is occasion for genuine joy and happiness. Thanksgiving is recognition that the gifts we hold in our hands and heart are not solely the results of our own efforts. We are indebted to others and ultimately to God for vast contributions to our well-being. Thanksgiving is a reminder that no life is a solo flight. But in fact there is one with us who “will never leave us of forsake us” who is the source of every good and perfect gift. Thanksgiving is confession of these times of ingratitude, which have distanced us from the mighty God. It provides opportunity for worship and reconciliation. As the year quickly draws near to an end we look back over the course of our study. What can be said as we realize how far we have come? I guess all that can be said is, “Keep Growing”. Vision: See where you are and know where you need to be. Where are you now? Devotion - Commune with God Daily. How is your prayer life? Attitude - Develop the fruit of the Spirit in your life. Are you following Christ’s example? Worship - God, not man, is the focus of our worship and praise. Do you approach worship with a sense of awe? Purity - Strive daily to live pure in a polluted world. Are you taking a stand? Service - We are not here to be served but to serve. Where do your talents lie? Overcome - Heaven is our hope! Are you focused on the prize? Encouragement/Fellowship - Christianity is a one-another religion. Are you open to your brother’s burdens? Bible Study - God speaks to us through His word. Have you been more diligent in your study? Evangelism - The Lord is looking for laborers. Have you shared your faith lately? Thanksgiving - God is the source of every blessing. Have you given thanks? Endurance - What areas do you still need to work on? It is time to begin again. Remember....Keep growing!